Two sepia-toned photographic prints mounted to opposite sides of heavy cardstock. 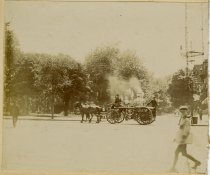 The image on the recto shows a horse-drawn fire engine crossing an intersection. A heavily treed area, likely Grand Circus Park, is visible in the background. The base of a moonlight tower is at the right. A boy peers toward the camera while stepping into the street in the foreground on the right. The picture on the verso depicts a man in a bowler hat and sport coat standing atop a bridge across a canal. A large building and several trees are visible across the canal in the background. 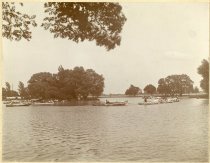 Mounted sepia-toned photographic print of a parade of canoes on one of Belle Isle's lakes. Several of the canoes on the right are tied together in a chain, wrapped in fabric, and decorated with streamers and garland. Canoeists paddle their canoes separately on the left. A figure on the on the shore in the background on the left appears to be aiding in raising or taking down a tent. Several other park-goers are visible around the banks of the lake. Whitewater Canal at Metamora, Indiana. 4. Canal, Belle Isle, Detroit, Mich.
Color postcard depicting people canoeing on a Belle Isle canal lined with trees. Handwritten message on verso, postmarked Sep 2, 1909. 5. Canal Scene, Belle Isle Park, Detroit, Mich.
Color postcard depicting canoes on a Belle Isle canal, with many people along the shore and a bridge in the background. Handwritten message on verso, postmarked Nov 5, 1908. 6. Band Pavilion, Belle Isle, Detroit, Mich.
Color postcard depicting a crowd gathered for a concert at the Band Stand on a bridge over a canal on Belle Isle. People are seated along both shorelines and many canoes fill the canal. Printed on verso: Band Pavilion, Belle Isle. Band Concerts are given at the city's expense during the summer afternoons and evenings. These concerts draw immense crowds, both shores being lined with pleasure seekers, while the graceful canoes throng the canal. Handwritten message on verso, postmarked Jul 8, 1909. Black and white photo of a trail running to the right of one of Belle Isle's canals. A bridge spanning the canal stands in the background. A figure is visible standing atop the bridge. Leaves cover the ground. "#717 Path along the Canal (bridge) Belle Isle 11/19/05," is handwritten on the verso. 9. A Bridge, Belle Isle Park, Detroit, Mich.
Color postcard depicting people canoeing under an ivy-covered bridge over a canal on Belle Isle. Handwritten message on verso, postmarked May 11, 1908. 10. Band Stand at Night, Belle Isle, Detroit, Mich.
Color postcard depicting a crowd gathered for a concert at the Band Stand on a bridge over a canal on Belle Isle at night. People are seated along the shore and many canoes fill the canal. Printed on verso: Band Stand, Belle Isle. Belle Isle is in the Detroit River between Detroit and Windsor, Canada. The Island contains 702 acres and is entirely covered with one of the most beautiful parks in the United States, having some 21 miles of Macadam Roads, a magnificent Casino; Pavilions; Boat Houses; Aquarium, Horticultural Hall and Zoological Gardens. The island was purchased by Detroit in 1879, and has since then expended $1,600,000 in beautifying it. Handwritten message on verso, postmarked Jun 8, 1913.